Two hats for spring and summer to have some fun making and wearing! HAT WITH BOW – Cord is threaded around edge of hat and tied with a bow for a perfect fit. ROLL BRIM HAT WITH FLOWER – Top has six triangular segments followed with a scalloped panel that stretches easily for a comfortable fit. 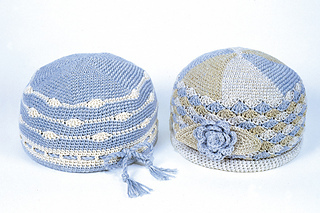 Both hats have an easy scallop design. The pattern has an illustrated stitch guide for single crochet, double crochet and changing yarn color, as well as written directions and a diagram to show how to make the cord for the hat with a bow. American crochet terminology.